When it comes to my facial skincare, I stick to the motto cleanser, tone and moisturise. 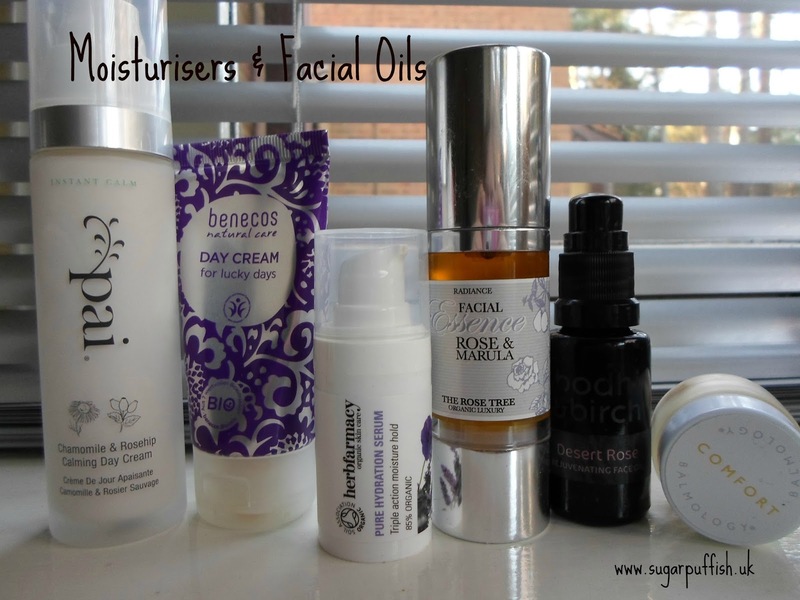 I try and resist having too many products on the go at once because my skin just does not cope with constant change. I tend to only switch products when existing ones have run out. I thought I would give you a sneak peek into my bathroom and show you the products I am currently using. 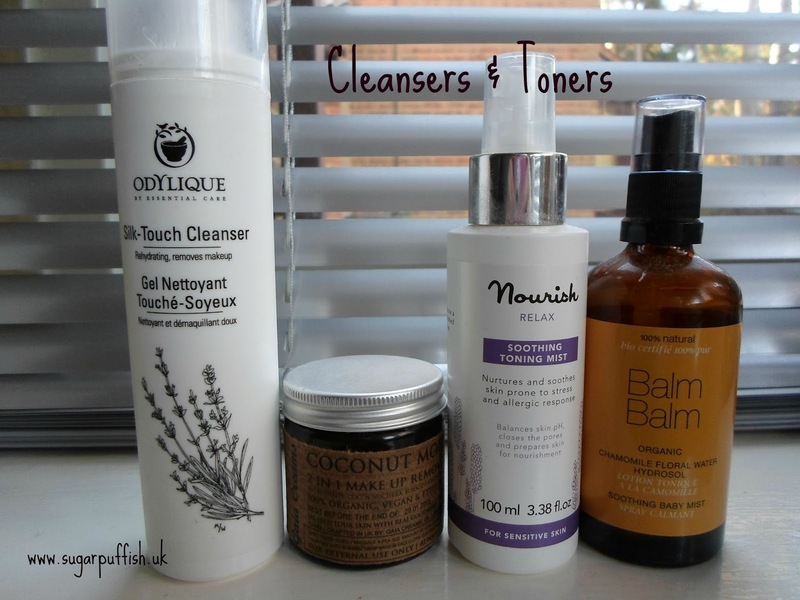 I rotate my cleansers depending on mood and how my skin is behaving. You will spy the Odylique Silk Touch Cleanser in my next empties video as it ran out this morning. I like the formulation, it starts as a gel and when you add water it transforms to milk. Sadly, the scent is not to my personal taste so I would not repurchase. I have already written a review for Gaia Cream 2-1 Coconut Mousse Cleanser. I like this soft buttery balm and it works well for my skin. Not everyone sees the value of toners and I always feel like they are missing out on this important step. For me toners help refresh, soothe, cleanse and balance my skin. I opt for ingredients which help with sensitivity so I have had Nourish Soothing Toning Mist and Balm Balm Chamomile Floral Mist in rotation for several months. I highly recommend both and have repurchased several times. I am fickle with moisturisers. I have firm favourites which I go back to time and time again, like Pai Chamomile & Rosehip Calming Day Cream but I also like switching things up. I was gifted Benecos Day Cream* and Herbfarmacy Pure Hydration Serum* in a goody bag. As a standalone product, Benecos cream certainly offers value for money but at this time of year it’s not rich enough for my skin. In order to boost the product, I have been applying the Herbfarmacy Serum underneath. It’s a nice combination which appears to be working well for me. During the winter I am prone to small patches of eczema around my eyes and on my chin. In these situations Balmology Comfort Balm* is currently my go to product. For the evening I like to switch from cream to oil, especially in the colder weather as I feel my skin needs some extra TLC. My much loved Odylique Superfruit came to an end so I am currently using up what I had in my stash. Depending on my mood, I’m alternating between The Rose Tree Radiance Facial Essence Rose & Marula* and Bodhi & Birch Desert Rose Facial Oil*. So there you have it folks, a quick look into the products I am currently using. It goes without saying that since I’m a beauty addict, my products are always changing. Have you tried any of the beauty items I have mentioned here? I’ll be looking to replace the Odylique cleanser now it’s finished. Do you have a cleanser recommendation? I am like you…I like to keep it simple and only repurchase when a product runs out. Ylang Ylang is not a fragrance I enjoy so that was the issue otherwise the texture is very good & something a little bit different from the usual oils and balms. Ooh I do love seeing people's skin care routines! I might share mine in the new year once I've settled on which cleansing balm to buy!! I want them all!!! haha! I see you're a fan of Floral and Rose type products... have you tried the rose toner from Oh Organics? I believe you can get them from Vanessa's Choice. I use the Vanessa one from her 'teen' range because my skin thinks I am still in puberty lol. As for cleanser recs... I am a firm balm/oil cleanser kind of girl so I can't help much there I am afraid. There are so many good cleansing balms out there, I never manage to stick to the same one as when it's finished I'll move on to the next one available to me. I do like florals but I'm not a lover of rose unless it's very well mixed with other scents. Have you tried the Pai cream cleanser?